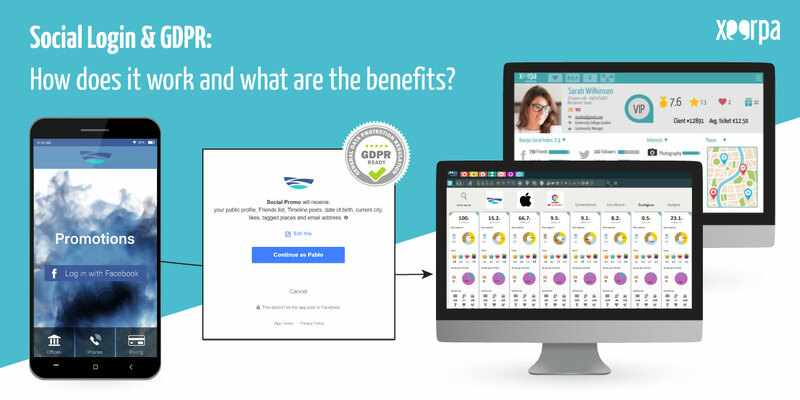 Social Login and GDPR: how does it work and what are the benefits? In this Guide we analysed how the new GDPR affects consumers’ private data collection and processing, and we explained the necessary steps to adjust the registration pages to the requirement of the Reglament. In the following post we will go through the benefits of incorporating Social Login into registration forms, for both users and brands, in particular in relation to the new General Data Privacy Regulation. By the registration form here we understand any online form that has to be filled in to register on a Web, a mobile App, to participate in a contest or a sweepstake, to join a members’ club or even connect to a free WiFi in a shop, restaurant or event’s venue. The data collected in this form is of a personal nature and helps to communicate with the individual for the purposes that are to be clearly explained in Terms & Conditions. Every brand should evaluate what kind of personal data to request to maximize its utility and minimize rejection, and the advantages to offer in exchange of this data. The transparency of data use is nowadays not only compulsory by law, but also highly demanded by consumers. Bear in mind there are 2 ways to complete the registration process: by filling in a traditional questionnaire form and through Social Login. When the user chooses the traditional option, all the fields of the form are to be filled in manually. However, when the user chooses to use Social Login, the form auto fills with the data extracted from the Social Network that the user chooses to share with the brand. The form contains legal and GDPR opt-ins and may ask for additional information to facilitate matching the profile with the CRM, as post code or phone number in the above example. Agile and easy-to-use: a couple of clicks autofill the form. No need to remember username and password. Informed consent – selection of Opt-ins. Better personalisation of content and offers. Standard and transparent process that facilitates GDPR compliance. Single user registration in the omnichannel model. Possibility to request additional information to match the register with the CRM data. Decision on marketing investments based on relevant data analytics. Impact precision: better segmentation capacity and UX personalization. Undoubtfully, Social Login offers nothing but benefits. In the last couple of years, it evolved from being a tool used by “early adopters” to a quite common practice. f you are wondering what other user data you can obtain in addition to that extracted from the registration, and – more importantly – how to use them with maximum utility? Stay tuned with our blog or ask us right now.